The Barrio Duo is an Arizona based guitar duo comprised of José Luis Puerta and Jonathan Crissman. The duo formed in the spring of 2016 when they were soloists with the Arizona Guitar Orchestra, performing Brad Richter’s “Once We Moved Like the Wind,” an homage to Geronimo. 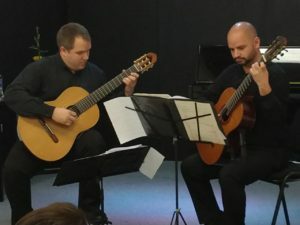 The piece was performed throughout Arizona as part of a three concert tour, and the success of the performances prompted José Luis and Jonathan to continue their collaboration. The Barrio Duo’s current program is influenced by the research that both members made for their Doctoral degrees. Jonathan’s research was on the eighteenth-century keyboard music of Antonio Soler, and José Luis studied the folkloric elements in ensemble music from Latin American composers. The Barrio Duo is able to combine scholarship with performance, engaging with audiences on both fronts. They continue to teach masterclass and performing in the southwest United States and most recently in The IV Festival y Concurso Nacional de Guitarra Clásica de Los Mochis (2018) in Sinaloa Mexico, and at the Centro Sinaloa de las Artes Centenario in Culiacan, Sinaloa, Mexico.